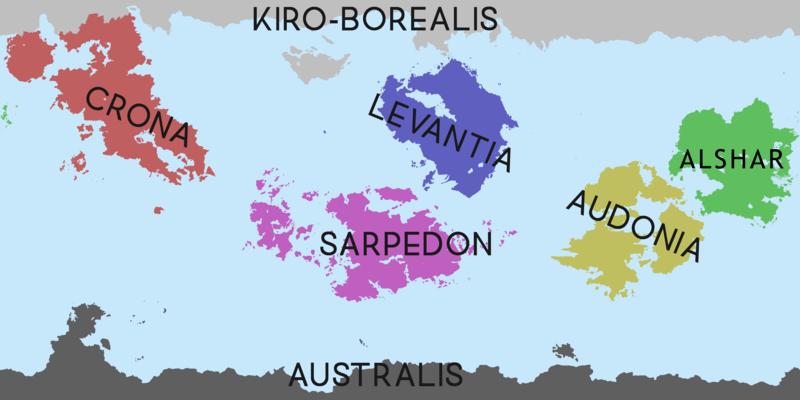 The Kingdom of Dorhaven is a kingdom in Sarpedon under a real union with Urcea. A densely populated country, Dorhaven has often been described as a cultural crossroads between Levantia and Sarpedon, but also between the social heritages of both Istroya and Adonerum given its proximity to the center of these continents and civilizations. Dorhaven's history as a semi-independent entity began in 1782 following the conclusion of the Veltorinan Independence War with Caphiria, when it was given to Urcea as compensation for its participation on the side of Veltorina. Since that period, the Kingdom has seen intermittent waves of migration, including Levantine settlers but also various outcasts and refugees from Caphiria, especially Levantine Catholics fleeing Caphiria after the beginning of the schism and formation of Imperial Catholicism. While Dorhaven was once a thriving service economy due to the large-scale Urcean military basing in the Kingdom as part of the Occidental Cold War, the economy has been undergoing rapid changes and partial decline as part of the gradual ending of hostilities between Urcea and Caphiria. As Dorhaven has been totally demilitarized as of the Assumption Accords, the economy has shifted more towards global trade by the merit of Dorhaven's geographic position. As part of the Accords, free trade with eastern Caphiria has begun which has strengthened the changing economy, but it's expected Dorhaven as a whole will see major changes in economic sectors as the 21st century progresses. The original Sarpic term for the region was "Tor Hayn", a term of undetermined meaning, though some scholars have posited that it meant something resembling "trade lands" due to its proximity to the cores of the ancient Istroyan and Adonerii civilizations. The area had very little Latinic settlement following its conquest by Caphiria and the native terminology continued until bands of raiders and adventurers from the Oduniyyad Caliphate conquered the region, when linguistic corruption took place. Following the Caphirian reconquest a few decades later, the area became known as "Dorhavenum". Following the Urcean conquest, the name of the Kingdom became "Dorhaven", after the common Aenglish naming convention. Much of what consists of modern day Dorhaven was sparsely populated tribal and, later, agricultural lands inhabited by communities of native Sarpics, with a few major Istroyan and Adonerii cities established in Antiquity. Consequently, most of the local Sarpic tribes fell under Latinic influence and began to speak the Latinic language. Caphiria conquered the region during its Republic period, though during the initial period of Caphirian control most local customs were respected and the area operated with considerable autonomy. Within the context of Caphirian control, the Latin-speaking city of Zaclaria began to exert a major influence over the local tribes and other cities in the third century and became a major center of trade for the next several centuries, and as a consequence the city spawned a major cultural exchange that resulted in a divergent and unique culture growing in Dorhaven, mixing Levantine, Sarpedonian, Istroyan, and Adonerii influences into a unique Latinic subculture. The first period of Caphirian rule came to an end with the arrival of the Oduniyyad Caliphate in the 7th Century. While the Caliphate did not directly threaten Caphiria in the north, groups of adventurers from Oduniyyad-controlled southern Sarpedon came north and conquered the largely autonomous region in 690 AD. In the process, Zaclaria was sacked and largely destroyed as trade into the area ground to a halt. Caphirian forces finally overcame the invaders in 763 AD and reestablished control, albeit more directly as was the case elsewhere during Caphiria's Principate period. In the reorganized province of Dorhavenum, the Caphirians established the city of New Zaclaria not far from the ruins of the old city, and trade resumed into the region, bringing goods from Audonia and Levantia into Sarpedon. Far overshadowed by the power of Venceia, New Zaclaria nonetheless managed to prosper during this period, and many traders going to Venceia would make a stop at New Zaclaria. Dorhavenum, a culturally divergent part of Caphiria, remained firmly in Venceia's hold until the middle of the 18th century, when it joined the other eastern provinces in the Veltorinan War of Independence. New Zaclaria was sacked by Caphirian forces in 1779 and the province was largely pacified, but the Urcean intervention in 1782 overcame Caphirian defenders in Dorhavenum. As trade and aid filtered through Dorhavenum's ports to the rebelling forces, and as the Royal and Imperial Army advanced in from the coast, the Veltorinan rebels were gaining an upper hand and ultimately secured their independence. Largely occupied by Levantine troops and controlled by Levantine merchants during the occupation, Dorhavenum was ceded to Urcea as compensation for their intervention. Controversially, it was not joined to the Holy Levantine Empire, but rather kept as a separate Kingdom in personal union with the Urcean Crown, a move with alienated the Collegial Electorate. Acquisition of the renamed-Dorhaven was a key part of Urcea's strategy to secure overall control of the Julia Bay, and the so-called Julia Bay Cessions started the phenomenon of Levantine Creep among Caphirian intellectuals. Dorhaven initially operated with some autonomous function, but as the 19th century continued, reforms to the Urcean government brought its periphery vassals into a tighter orbit of Urceopolis. As the Imperial schism was unfolding, many Levantine Catholics fled Caphiria for Dorhaven, greatly expanding the population of the Kingdom. During the Great War, Dorhaven saw increased attention as the Levantia and Odoneru Treaty Association (LOTA) began to stage forces for assaults on Caphiria within the Kingdom. These ad-hoc military bases were later rebuilt for permanent LOTA use during the Occidental Cold War, as the military and military families from Levantia and Insui became an important part of life in Dorhaven, and a cornerstone of the economy. Dorhaven's importance rose dramatically as Caphiria annexed Veltorina, creating yet another land border As bases began to dot the countryside, agricultural developments gave way to a service-based economy aimed at accomodating the millions of soldiers stationed in Dorhaven throughout the Cold War. Upon the signing of the Assumption Accords, demilitarization in Dorhaven and Veltorina meant an end to the more than eighty years of military presence in Dorhaven, leading to dramatic changes in the economy. Despite this, many investors have expressed interest in the potential of the rapidly changing economy. Caphirian investors and visitors have become commonplace in Dorhaven since the time the Accords were signed, and analysts have speculated that Dorhaven may once again become a primary port of entry into Sarpedon and crossroads of the Occident.